The pressure washer is becoming popular among the people all around the world due to its lot of benefits. Sometimes it is called the versatile cleaning equipment. From cleaning walkways to washing cars it performs superbly. There are several types of pressure washer avai0lable in the market. Among them, some are driven by electricity and some are gas-powered. Each type of pressure washer has some good sides as well as some drawbacks. 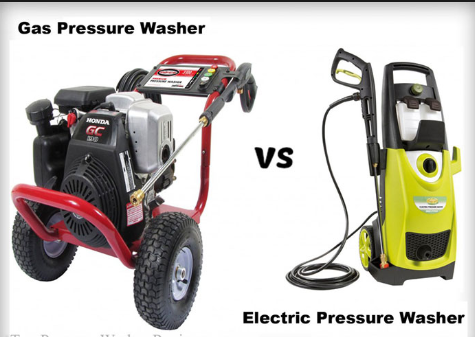 In this type of article, we are going to discuss the comparison of electric pressure washer vs gas pressure washer. It will include their performance, price, pros & cons, and other sides. We will try to compare several available products of the market to get a nice conception of the product. Electric pressure washers are run by electricity. They are lightweight and their weight lies between 20 to 45 lbs. As they are electrically driven there is no necessity of refueling and hence it is free from hassle. Its operating cost is cheap and everyone can afford it easily. But, it has some drawbacks too. It is not very good for doing very pressure intensive tasks as they are not capable of producing it. In addition to that this machine is not versatile in nature as it is useless at the places where electricity is not available. This type of pressure washers uses gas as fuel. They are heavier and powerful than the electric type. Their weight lies between 55 to 90 lbs. They can handle tough tasks and the transportation of this type of pressure washer is easier. But, the refueling issue is related to this type of pressure washer and it is costlier than the electric type. Before going to compare pressure washers of any type it is important to have sufficient knowledge on some technical and non-technical factors. Price is obviously an important issue. Gallons per minute indicates the water exertion rate of the pressure washer per minute at a certain pressure. The pressure of water plays an important role here. Cleaning unit (CU) of a pressure washer indicates the fast cleaning capacity of a pressure washer. Before declaring a pressure washer good or bad it is also important to consider its movability. Depending on quality, performance, model, etc. price varies. Electric pressure washers are cheaper than gas type. Normally it lies between $75 to $250. You will find a very good quality electric pressure washer if your budget lies around $150. As like as capacity and heaviness price of gas pressure washers are also higher than the electric pressure washers. It lies between $200 to $2000. Usually, higher price gas pressure washers are commercial grade. Gas pressure washers for household uses lies around $300. 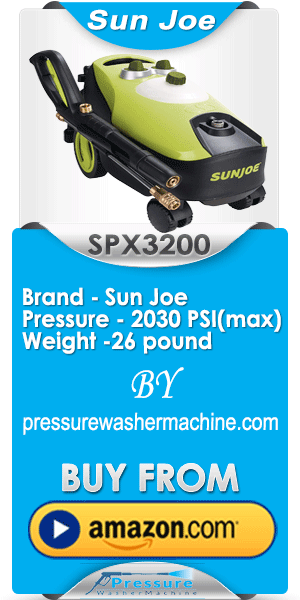 Sun Joe SPX3000 is an electric type pressure washer and it costs $150. Karcher K5 Premium electric power pressure washer costs $286. Simpson MSH3125-S gas powered pressure washer costs $379. Transportation and warranty conditions vary from brand to brand. It is expressed by gallons per minute or GPM. Usually, one to four gallons per minute is enough for household use. But, for handling tough dust and dirt it requires high GPM rate. Commercial grade pressure washers are capable of exerting more water. Simpson MSH 3125-S exerts water at 2.5 GPM rate and Sun Joe SPX3000 exerts at 1.76 GPM rate. Another factor to consider is water pressure. The more pressure means more power. It is the precondition to giving perfect cleaning. Commonly commercial grade gas pressure washers are capable of generating more power than those who are designed to perform at the household level. Pressure washers of electric type can produce pressure up to 2000 psi only whereas gas pressure washers can create pressure more than 4500 psi. Simpson MSH 3125-S can create 3200 psi pressure. Sun Joe SPX3000, Karcher K5 premia are electric type pressure washer and their pressure capacity is around 2000 psi. It indicates the capacity of a pressure washer to clean fast. The more cleaning unit means more cleaning capability. For small scale, usage cleaning unit should be nearly 2000 CU. Electric pressure washer’s CU rating is from 2000 to 8000. Gas powered pressure washers have higher CU rating. It lies between 8000 to 30000. Industrial grade pressure washers have more CU rating. Sun Joe SPX3000’s CU rating is 3573, Greenworks 1950 PSI’s CU rating is 2340, and AR Blue Clean AR390SS’s CU score is 2800. Electric pressure washers are generally lightweight and they are easy to carry. Gas powered pressure washers are heavy and they are difficult to carry easily. But, the latest designed gas powered washers are equipped with rollers and they can be taken from one place to another with some efforts. Simpson gas pressure washer is a powerful pressure washer. It has a 190cc Honda motor and includes a high-pressure long-lasting hose that is capable of resisting kink and abrasion. Its user-friendliness and excellent feature like high CU score, GPM, etc. made it popular among the people dealing with stubborn dirt. Sun Joe SPX3000 has a powerful motor 14.5A and 1800W rating. It has exclusive TSS (Total Stop System) which saves energy and water consumption. Moreover, it has two onboard detergent tanks. This product is approved by CSA. Karcher K5 Premium is an electric pressure washer and it includes a Vario Power Spray wand and DirtBlaster Spray wand to make the cleaning task easier. Its N-COR pump is durable in nature and corrosion resistant. Its induction motor has a cooling system that increases its lifetime. So, pressure washer, a great tool to make the cleaning task much easier more than ever before, is very handy equipment for the household as well as commercial workplaces. Electric-type pressure washer and gas powered pressure washer have individual characteristics and functions. So, it is not easy to declare a specific type of pressure washer superior to another one. Even selecting a specific brand is also a difficult task. But, on the basis of customer reviews and other factors, we may say that Simpson MSH 3125-S is a top class gas powered pressure washer and Karcher K5 Premium is one of the best picks of the electric type pressure washer.